Calling it the "Car of the Future," KleenSpeed unveiled the KAR, a $10,000ish electric car with a 150 mile electric driving range, that could erase one of the major hurdles to electric vehicle adoption, if the company can find a manufacturing partner. What would be the modern electric car equivalent to the old school VW Beetle? Small, inexpensive, designed for the people, that's what the original Beetle stood for (unlike today's caricature of the Beetle that's on sale now). Calling it the "Car of the Future" and the "VW Bug, in the electric version," KleenSpeed CEO Tim Collins unveiled the KAR on Wednesday evening at the San Francisco Auto Show. The KAR is a very small, two seater, inexpensive ($9,995) electric car that amazingly delivers a lot of power and a massive 150 mile electric driving range. The combination, of a massive electric range and a tiny price has not yet been done by any electric car maker. KleenSpeed has a business model with which they could pull this off. The ultra-low price does depend on a high manufacturing volume, and a leased battery pack. By leasing the battery pack its' cost is removed from the KAR's MSRP, and is replaced by a monthly lease fee. How much? That's envisioned to be $175 per month. The Renault ZOE is also sold under a similar model, with a lower up-front cost and a leased battery pack. We covered the initially revealed specs of the KAR on Monday, but the company released on Wednesday more details. There are two versions of the KAR. The KAR S EV is the normal version, and its estimated MSRP is $9,995. The KAR GT EV has a beefier suspension that's closer to racing quality (Tim Collins has a background as a race car driver), and its estimated MSRP is $13,995. Both models offer the same 40 kilowatt-hour battery pack, giving a 150 mile electric driving range. The drive train is built around a UQM 100 kilowatt motor & controller spec'd at 134 horsepower and 221 ft-lb of torque. The wheelbase of 80.9" puts it in the ballpark of the Smart Fortwo or Fiat 500. The 0-60 time of 6.5 seconds means it'll have fun acceleration but top speed is limited to 85 miles/hr. Collins was boasting it'll go faster than a Tesla Model S, but maybe he hasn't looked at the S's spec sheet. He was present last summer when five Tesla Model S's smoked that many Tesla Roadsters at last summer's REFUEL race, and KleenSpeed does participate in REFUEL every year. Maybe Collins will be putting his money where his mouth is at next summer's REFUEL race, and pit the KAR against the Tesla's? While Tesla and KleenSpeed are targeting very different markets, the KAR's claimed 150 mile range as well as the zippy acceleration does make us want to name a point. The two obviously appeal to different classes of people. One critique of Tesla and Fisker is that while it's great they're building electric cars, both companies are targeting the ultra-rich while promising they'll eventually get lower priced models on the road. KleenSpeed, however, is starting from the low cost mass market end of the spectrum. Like the Tesla Model S, the KAR prototype has a fully digital dashboard and touch-sensitive central display panel. The central display panel looked like it was 12-15" in size and occupies the space where the heating/cooling/radio controls would sit. The KAR is turned on and off from this control panel, and you also select forward/reverse/neutral from on-screen buttons. There is a telemetry system which can, at the KAR owners option, send data back to KleenSpeed servers. The company has an enlightened attitude about that data. First, they've partnered with Scrambls, a division of WAVE Systems, to provide data encryption to ensure the data is transferred securely over the Internet. Second, they describe the data that's collected as being the car owner's data, and intend to make all the data available rather than locking it away as other automakers do. The KAR on display at the show is a prototype model and had a few rough edges. The build quality of the passenger compartment seemed reasonable given the price and the fact that the KAR's body is sourced from Chinese automakers. A company spokesperson said to expect quality similar to other $10,000 cars. Its design features two main units: The skateboard chassis containing the battery pack, suspension, and drive train; with the KAR's body and passenger compartment bolted on top. The chassis was designed by KleenSpeed's engineers, and what the company brings to the table is the full system of motor control system, integration with the UQM drive train, battery pack and battery management systems. The company's intent is to license the design to other manufacturers who will build car bodies that attach to the KAR's base chassis. 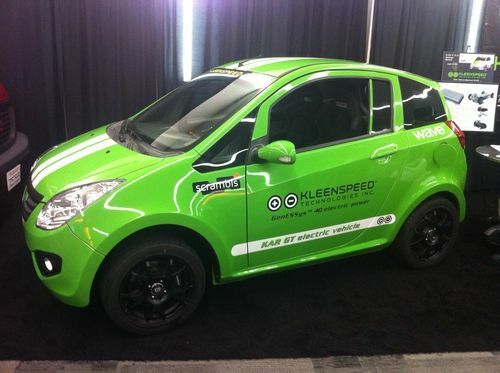 For a tiny start-up automaker, KleenSpeed has big plans. To achieve the $10,000ish MSRP they have to somehow ramp up production higher than any other electric car has been manufactured before. If this can be done, they will have erased one of the major barriers to electric vehicle adoption, the high out-the-door purchase price. The price, speed and electric driving range should make the KAR a killer combination, if they can work out the rough edges and line up a manufacturer and dealer/distributor network. There's a lot to like here, but a few things worth questioning. We do, in fact, really need the equivalent of a Model T or old school VW bug for the EV age - and it sounds as it KleenSpeed's KAR could be a contender - but I think they should offer different sized battery packs. A fixed monthly rental rate of $175 on a big battery (on top of monthly purchase payments of the KAR itself for at least the first few years) would be a deal killer for much of the budget market this EV is supposed to appeal to. What are these cars proposed to replace? Older gasoline subcompacts, no doubt. Gasoline would have to be around $8 per gallon for the $175 monthly battery rental to be even remotely attractive. I'd prefer to see a slightly higher MSRP ($15K to $17K, perhaps) on the vehicle and simply include a smaller battery. Some might find the rental of a bigger battery pack an attractive option, but not everyone. Urban drivers who have never driven an EV think they need 150 miles on a single charge but, once you have actually lived with one under normal circumstances and gotten used to the concept of charging at home overnight, you realize that a range of 90 to 100 miles is more than sufficient. If you want a longer range EV, you probably also want more passenger and cargo space to go with it. There's a danger here of attempting to make the KAR all things to all people. KleenSpeed could also de-emphasize the racy performance specs and simply give us honest freeway on-ramp capabilities without the histrionics of having us all want to drag race a Tesla in our 4-door subcompacts. This may also be too much to ask for in today's gadget-obsessed world, but I'll digress. Keep it simple! What's with sending driving data back to some server? You don't need that for a vehicle that will mostly be used to make 5 mile commutes to work or trips to the grocery store. Just put a decent battery state-of-charge indicator on that touchscreen and be done with it. I like the idea of the KAR. I just hope the developers actually give us an electric everyman's (and everywomen's) vehicle without making it overly complex and unnecessarily encumbered with gizmos that a budget car buyer could really live without. If they can do that, they really could give us the first real EV for well under $20K without rental add-ons. When I read about the KleenSpeed in the Friday Chronicle, with their promise of an EV for $9,995 , I was truly excited. When I found out that the cost of leasing the battery pack was $175/mo, it definitely dampened my enthusiasm. After five years that would double the price of the car. That still isn't bad, compared to the EV's that are available currently. I guess there's always a catch. Another writer hoped that they might offer a smaller battery pack (with reduced range) for a lesser amount. Sounds like a great compromise to me. The need for a 150 mile range, in a car that seems more adapted to city use, seems like overkill. Hopefully, they will work out the kinks. Overall, it seems like a big step forward towards an affordable EV! I sincerely hope they succeed. The website has no officially posted specs, I would wait until Some are developed before believing any of numbers that are written here. Being an environmental realist, but you boast you can make a better car than Tesela, for $10k, the management has some perspective issues. Additionally consumers will have issue with the stated 85 mph cap, in addition to the aesthetic of the vehicle. The car looks horrible, no one buys a bad looking car regardless of the cost/technology that's under the hood. This is why Tesela and the 2012 Leaf have been successful, the car looks like a normal car or even stylish to modern standards. The numbers I posted here are directly off the spec sheet handed to me by Kleenspeed at the unveiling. I was the only journalist who bothered to show up - so far as I know. Of course the car they showed is a prototype and if they do license it out rather than manufacture it themselves, the actual spec's will depend on what the actual manufacturer does. Right? Of course the final specs will probably be different than this. Nice idea, very skeptical. Additionally it looks as if this company wants to be bought out and not expand to manufacturing, they just don't have the investment capital. For the cost of EVs, no EV sold will be $10k, market forces won't allow it. The Prius sold successfully for $25k as a solid, reliable vehicle. But $10k consumers may view that there is some sort of shortcoming, why so cheap? Until a tested spec sheet is released for the vehicle, I would not trust any of the numbers that are thrown around, especially in range, accelerations, max speed and price. Additionally, the car looks horrid, there is allot more than just technology efficiency that will sell a car. How the aesthetic is viewed can make/break a new car. This is where Tesela and Nissan (2012 leaf) have been successful. This is why you don't see any Smart Cars in the US, they just look too weird. That's an hoax: 10,000$ is just the price without batteries.... and 40 kWh batteries cost around 20,000$!